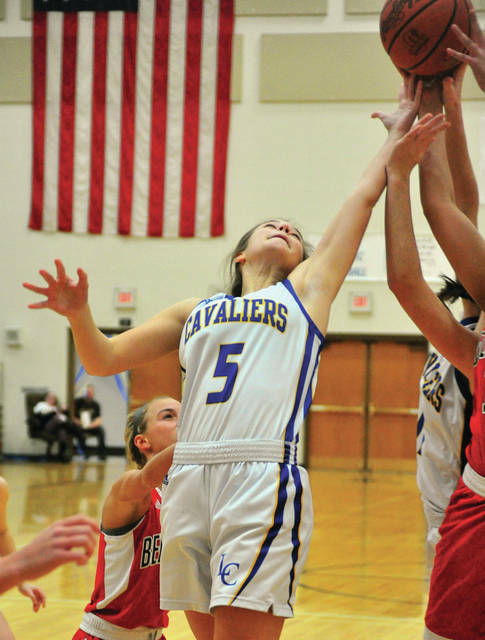 Lehman Catholic’s Rylie McIver goes up for a rebound Saturday against Bellefontaine. Lehman Catholic’s Emily Fogt makes a move against Bellefontaine Saturday. Lehman Catholic’s Grace Monnin shoots over Bellefontaine’s Taizha Collier Saturday. Lehman Catholic’s Grace Olding getz off a shot against Bellefontaine’s Hannah Rader Saturday. Lehman Catholic’s Hope Anthony, dribbles between Bellefontaine’s Lexxi Gorham (left) and Hannah Rader Saturday. 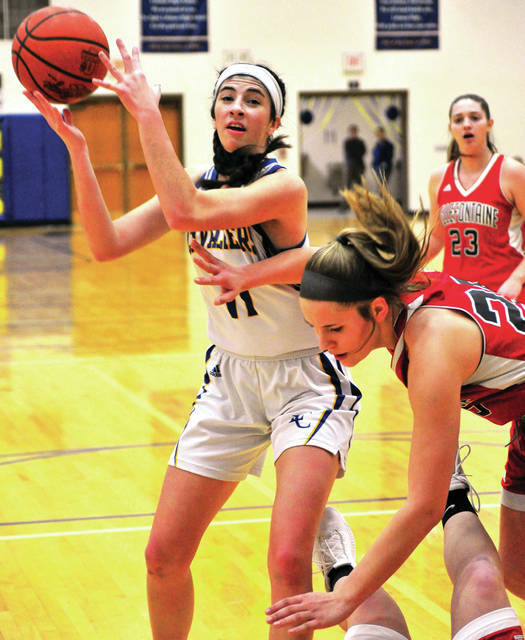 SIDNEY — Lehman Catholic basketball coach Craig Hall called it a “Tale of two havles”. It could easily be called a tale of “one quarter”. But, either way, the most important thing is the Lehman Catholic girls basketball team celebrated Senior Day with a 45-34 win over Bellefontaine Saturday. Lehman improved to 10-10, while Bellefontaine closed the regular season at 9-13. It was the final home game for Lehman seniors Allison Bornhorst, Carly Edwards, Emily Fogt, Grace Monnin and Grace Olding. As for the game itself, Lehman’s offense got started in the third quarter and it carried over to the defense in the fourth quarter. 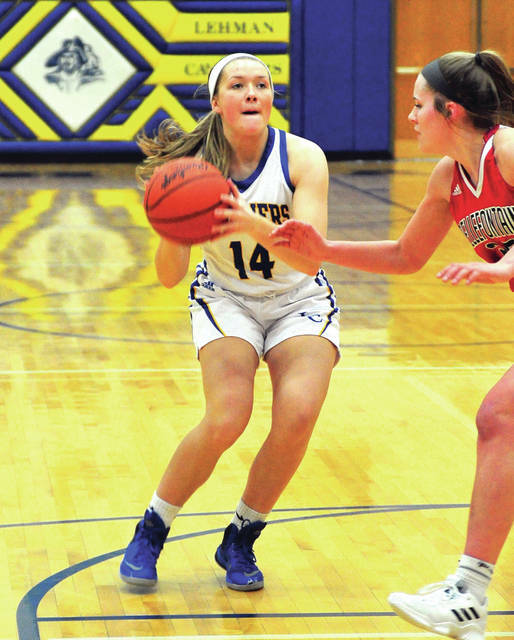 Lehman had trailed 18-13 at halftime, but Lauren McFarland hit two 3-pointers in the third quarter, but Bellefontaine answered with four shots from long range in the quarter — two each by Taizha Collier and Lexxi Gorham. The Chieftains still led 32-23 late in the third quarter, before Lehman finished the game on a 22-2 run. Anna Cianciolo closed the third quarter with basket to get the Cavaliers within 32-25. Monnin hit a jumper with 7:00 to go and Edwards hit two four straight throws to close the deficit to 32-31 with 5:52 remaining. After Cianciolo gave Lehman the lead for good on a drive to the basket, Rylie McIver scored and McFarland hit another three to make 38-32 with less than three minutes remaining. After that, Lehman hit seven of eight free throws down the stretch to seal the win. Edwards was a perfect 6-for-6 from the line in the fourth quarter and the Cavaliers were 11-for-14 as a team. At the same time, Bellefontaine made just two of 13 free throw attempts in the fourth quarter, along with missing all six of its field goal attempts. The game had started with both teams being ice cold. 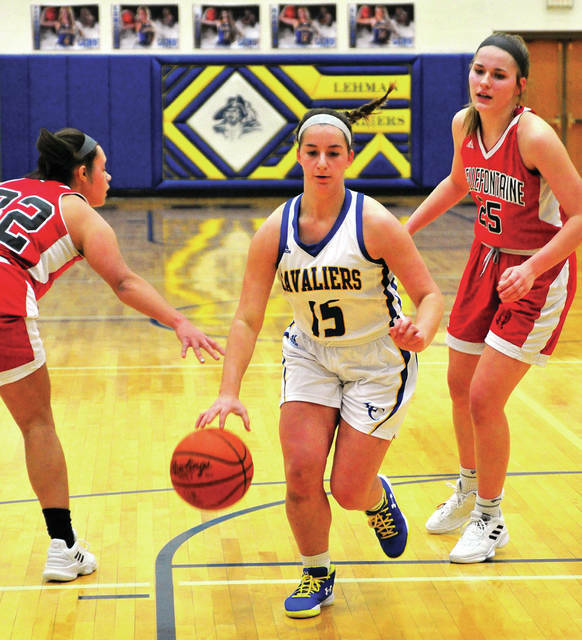 Through the first six minutes, Lehman missed all eight of its attempts from the floor and Bellefontaine missed its first seven and two free throws. The first points came on a basket by McIver and she would close the quarter with a bomb from almost mid-court to give Lehman a 7-5 lead. But, Bellefontaine guard Aubrey Stolly scored 10 of Bellefontaine’s 18 first-half points to give the Chieftains an 18-13 lead at the break, before Lehman came alive in the second half. McFarland had 12 points and three steals to lead a balanced attack. Monnin had eight points, four rebounds and three steals, while Cianciolo also scored eight points. McIver had seven points and four rebounds, Edwards added six points and eight rebounds and Fogt had four points and six rebounds. 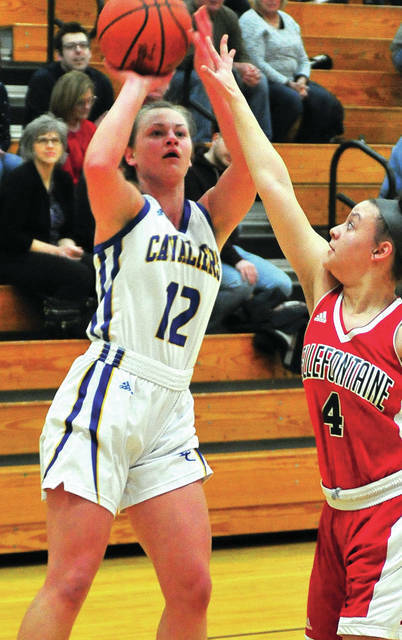 Stolly led Bellefontaine with 10 points, while Gorham had nine points and Collier added seven points and seven rebounds. Hannah Rader had nine rebounds and Anne West pulled down eight. Lehman was 15 of 45 from the floor for 33 percent and 11 of 16 from the line for 69 percent. Bellefontaine was 11 of 38 from the floor for 29 percent and five of 21 from the line for 24 percent. Bellefontaine won the battle of the boards 32-26, but had 14 turnovers to Lehman’s 10. Lehman will close the regular season at Ridgemont Thursday — after using a big finish on Senior Day. Aubrey Stolly 3-2-10, Caitlyn Shumaker 0-0-0, Taizha Collier 2-1-7, Chalony Tolliver 1-0-2, Hannh Rader 1-1-3, Anne West 1-0-2, Kailynn Kenner 0-0-0, Lexxi Gorham 3-0-9, Alivia Purtee 0-1-1. Totals: 11-5-34. Carly Edwards 0-6-6, Rylie McIver 3-0-7, Emily Fogt 2-0-4, Grave Monnin 3-2-8, Grace Olding 0-0-0, Lauren McFarland 4-1-12, Anna Cianciolo 3-2-8, Hope Anthony 0-0-0. Totals: 15-11-45. 3-point field goals — Bellefontaine: Stolly (2), Collier (2), Gorham (3). Lehman Catholic: McIver, McFarland (3). Records: Bellefontaine 9-13, Lehman Catholic 10-10. Reserve score: Bellefontaine 31, Lehman Catholic 29.